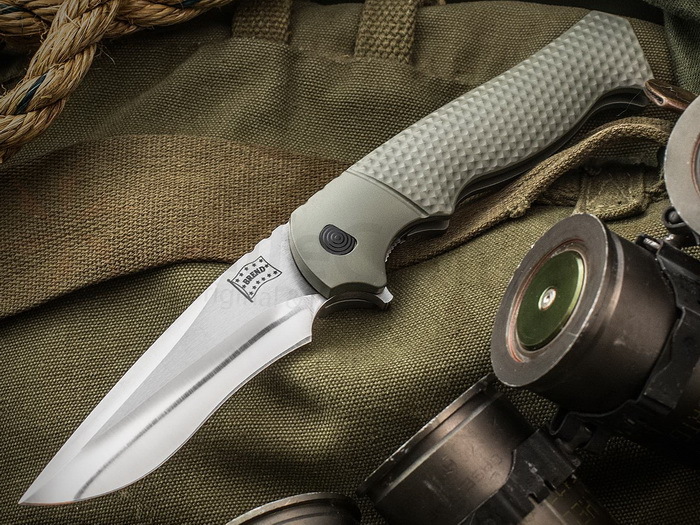 **** Chosen by Winner: Jeremy M.
Walter Brend's Model 2 Assisted Flipper is loosely based on Walter's Model 2 fixed blade. The blade shape and grind lines are the same, but Walter designed an entirely new handle which fits this blade perfectly and provides an excellent, ergonomic grip. It's large in size, contoured to fit the hand and textured for purchase in adverse conditions. This knife features a 3.75" hand ground blade made from CPM-PSF27 stainless steel with an OD green aluminum handle. It is spring assisted and opens with alacrity. Walter has been building knives for 40 years. He specializes in combat survival knives. He also makes hunting knives, neck knives and swords. He believes they must receive much care and attention to detail as these knives are intended FOR LIFE SAVING. Lives often depend on a knife. THERE CAN BE NO COMPROMISES IN QUALITY AND CUSTOMER SATISFACTION, WITH WALTER BREND THERE ARE NONE. Walter is confident his knives will take you anywhere you want to go.